SLR is a key component of SLM. 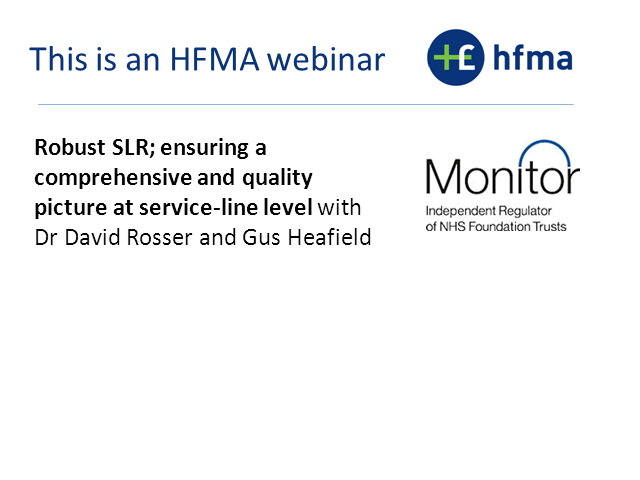 This webinar will focus on the importance of having timely and robust quality and financial information available at a service-line level. The speakers will highlight how robust information has supported both service efficiency and quality and safety improvements in their organisations, thus enabling improved performance at both service-line and trust level. Examples will be drawn from two trusts; one acute and one mental health. Dr David Rosser: Medical Director and IT Director University Hospitals Birmingham NHS Foundation Trust. Homerton’s ‘Achieving Together’ Programme is the blueprint for how the Homerton will deliver new, highly efficient services across the Trust up to 2020 through investment in and adoption of digital technologies. Leading the change in outpatient services, Homerton’s transformation team deployed Nuance Dragon Medical One speech recognition integrated into the hospital-wide EPR. Clinicians now use their voice to capture the patient consultation more naturally, efficiently and on their terms. Working closely with clinicians and medical secretaries the team re-imagined outpatient workflows and processes enabled by the technology. Homerton outpatients have cut costs, sped-up turnaround times and freed up precious resource, improving the working lives of the clinicians and improved patient experience. As finance teams prepare to finalise the 2018/19, this webinar highlights the key issues to be considered. The finance team of the year from Leeds Teaching Hospital NHS Trust will share the changes that they have made in the past year that have resulted in the trust moving from a deficit to making the largest surplus it has made in its 20-year history. The HFMA have collaborated with and the Faculty of Medical Leadership and Management (FMLM) to bring our members a series of live streamed panel sessions. These sessions will focus on issues affecting the future of healthcare, highlighting areas where clinicians and finance staff can work together to improve patient outcomes. Areas of discussion will include value based healthcare, new technologies and innovation. The first panel will be chaired by Caroline Clarke, Deputy CEO at The Royal Free London NHS FT. She will be joined by four doctors from different specialties from across healthcare. The second panel will be chaired by FMLM Senior Fellow Dr Jon Fistein who will be joined by four financial leaders from within the NHS. Trusts are spending millions of pounds each year on clinical correspondence. It’s also a burden for clinicians who can spend up to 50% of their day reviewing and updating the patient record and clinic letters. But, this is an area where Trusts can realise year on year cost savings with the investments in speech recognition solutions. Hear how Oxford University Hospitals NHS Foundation Trust have got control of clinical documentation costs and are driving them down. Learn too how they’re making their clinicians happy by freeing them from the burden of admin to focus on patients. As of 1 April 2019 the majority of VAT registered businesses will be required to keep digital VAT records and send their returns to HMRC using making tax digital (MTD) compatible software. Very recently, it was announced that NHS bodies, along with other not for profit organisations, would not have to comply with the new requirements until 1 October 2019. This is because they have to provide additional information on their VAT return. The pilot for the deferred businesses to test the MTD will open in Spring 2019, it has just been launched for those implementing the changes in April. IFRS 16 is expected to be applicable from 2019/20. This webinar will consider what the standard says, what we know so far about how it will be applied in the NHS and what this means for NHS bodies. 'Stepping out from behind the spreadsheet' means focusing less on doing, and more on being a leader within your specialism. Developing good habits, utilising the resources around you and slowing down to look into the future are key to success in this area. In this webinar we will explore ….. These webinars are designed to stimulate your thinking and to pique your curiosity. We’re not in the business of telling you what to do, but we do want to help you access your own innate wisdom and apply it to find new solutions to your work challenges. Join Bev Holden & Kate Hargreaves from The Clear Thinking Partnership and find out more. Bolton NHS Foundation Trust has been delivering Working Day One Reporting since October 2013. It took eight weeks from conception to delivery of the project with huge benefits. Working Day One Reporting has enabled the finance team and the organisation to take huge strides forward in it is culture and performance. The team has been delivering sessions on Working Day One Reporting all over the country at various events and visits. The focus of the sessions isn't just about the mechanics of delivering Working Day One Reporting, but also team work and developing a performance culture within a team. The webinar is not just aimed at teams involved in reporting, but anyone who wants to develop their teams and build a "can do" culture. • How to create the best possible conditions for you to thrive at work, optimise the value you create and make a big difference through your work. These webinars are designed to engage your thinking and to pique your curiosity. We’re not in the business of telling you what to do, but we will share with you some ideas for how you can tap into your own innate wisdom and apply it to your situation. By taking a short break from your work to join us, you’ll be investing time in your most important resource, you! And you’ll leave the webinar knowing a little more about how you add value through your work. Financial stress is estimated to affect 68% of NHS staff, with a staggering 91% of those on a salary of £30,000-£39,000 admitting that they have been affected in the past 12 months. This online workshop will explore the facts and figures from a ground-breaking new report analysing “ The DNA of Financial Wellbeing” with specific NHS insights. Join us to discover how your organisation could be wasting as much as 14% of your payroll spend due to lost productivity, absence and stress related illness, and what the risks are of ignoring this problem. We will introduce you to the concept of financial wellbeing and explore how this can not only help your staff, but also your organisation at no cost. In conjunction with PwC this webinar will provide an overview of how the finance function can support strategic and transformation plans (STPs). Health and care systems are asked to come together to create their own ambitious local blueprints for implementing the Five Year Forward View. 44 footprint areas have been defined that will bring local health and care leaders and organisations and communities together for improved health, care and finances over the next five years. STPs are the single application and approval process for transformation funding for 2017/18 onwards that should be a genuine enabler for whole system transformation. This webinar will discuss the practical support that finance professionals can provide to deliver a financially sustainable STP. PwC will present a range of observations and lessons to implement financially successful STPs that has been gained from working with their clients. What is the RightCare programme and what can it help deliver? How does it link to Commissioning for Value? What has it achieved and why should we want it? How will it be rolled out across the system? The session will finish with NHS RightCare’s “Ten questions to make your CFO sweat. This webinar will be presented by Professor Matthew Cripps and Tim Savage. Professor Matthew Cripps BA MA CPFA is national director of NHS RightCare, a part of NHS England that focusses on population healthcare improvement and helping the wider health service to identify and use techniques, tools and methodologies to increase value in healthcare. Tim has worked in the NHS for 24 years, the last 15 as finance director in a range of organisations covering both urban and rural settings, turnaround and organisations with substantial development strategies. For the last 3 years, Tim has undertaken the role of regional finance director for NHS England in the North, working with the local and central teams and partner agencies. Please join us for this webinar introducing Crossing Professional Boundaries: a toolkit for collaborative teamwork, developed by The King’s Fund with Future-Focused Finance. The toolkit is a seven-step process to enable cross-functional teams to reflect on how they work together. Piloted across the NHS, an independent evaluation by CIPFA demonstrated an improvement in teamwork between clinical and finance teams, and consequently better outcomes for patients. This webinar will give an overview of the toolkit, and also give you the opportunity to ask questions on both the theory behind it and the experience of those who have used it. Professor Michael West of The King’s Fund has spent much of his recent career considering cross-boundary teamwork, particularly in the NHS, and is the driving force behind the toolkit. Dr Sanjay Agrawal, a Consultant at University of Leicester Hospitals, is the lead for Close Partnering for Future-Focused Finance. Future-Focused Finance, through its Great Place to Work action area, aims to enable individuals and teams to develop themselves to have rewarding and enjoyable careers in the NHS. Coaching & Mentoring are integral parts of this action area: the work stream aims to develop potential at all levels of the finance function. We have developed a series of six free webinars that seeks to give participants the skills to develop effective Coaching & Mentoring relationships and skills as both coach/coachee and mentor/mentee. The final webinar in our series of 6 is entitled “Supporting Coaching and Mentoring in Healthcare Finance Teams”. Coaching and mentoring occur in teams and organisations in three forms: external provision; internal provision and manager as coach. How do we create the environment, structure and processes to maximise the benefits of coaching and mentoring? How can we evaluate coaching and mentoring and continuously improve the coaching and mentoring services that we offer to our staff? Whether you’re new to Coaching & Mentoring, or looking to refresh your existing skills, join Sotiris Kyriacou, Future-Focused Finance, Great Place to Work Workstream Lead for Coaching and Mentoring, Jonathan Bowyer (HFMA, Executive Coach) and Claire Merrick (HFMA, Coaching & Mentoring Services Manager) to find out more. As we reach the end of a difficult financial year, it is important to understand the significant financial reporting issues for 2015/16 and future reporting periods. This FREE webinar will provide an understanding of reporting issues that may impact on the NHS and is relevant for all finance staff who want to consolidate, update or refresh their existing knowledge. Debbie works for the HFMA as a technical editor. This means she provides support to the HFMA’s Accounting and Standards Committee, FT Technical Issues Group, the Prescribed Specialised Services Commissioning Group and the newly formed Care without Carbon Special Interest Group . She is also involved with writing and reviewing HFMA’s publications as well as updating and developing e-learning modules. Before working for the HFMA, Debbie worked for over 20 years for PwC, mostly as a technical expert providing accounting and auditing support to auditors and NHS bodies. During that time, she helped develop the NHS foundation trust ARM and worked with the DH on IFRS conversion. Integrated Personal Commissioning (IPC) forms part of the NHS Five Year Forward View and is a joint initiative with the Local Government Association, ADASS and Think Local, Act Personal. IPC aims to give people with complex needs, more choice and control over their care; giving a better quality of life, fewer crises and an enhanced quality of life. This will entail a shift in control of resources with the option of a personal budget covering an agreed range of services spanning health, social care and education where applicable. •People with significant mental health problems. IPC also links with, and supports, work on the Better Care Fund, expanding Personal Health Budgets, New Models of Care, Transforming Care and many other systems change programmes. The webinar will give an overview of what IPC is and how it fits with current organisational and national priorities. •What is Integrated Personal Commissioning? Everyone has access to the NHS. But in order for it to be affordable everyone must make a fair contribution. Overseas visitors and migrants are already charged for the cost of any healthcare they receive in hospital. It is fair that people who are in this country for a short time should meet the costs of all NHS healthcare they receive. The Department of Health is currently seeking your views on how best to achieve this and has launched a public consultation Making a Fair Contribution. The fifth of the 6 webinars is entitled “Creative Thinking, Ideas Generation and Problem Solving”. Creative thinking, ideas generation and problem solving helps us to approach a problem or challenge in an imaginative and innovative way. We may be looking to increase the quantity of fresh ideas, develop a fresh or opposite perspective or reduce complexity by breaking something into smaller parts. When finance professionals working in NHS health organisations are being asked to facilitate and lead change, developing these skills in coaching and mentoring conversations can support transformation. Whether you’re new to Coaching & Mentoring, or looking to refresh your existing skills, join Sam Sherrington (Future-Focused Finance, Head of Stakeholder and Cultural Transformation), Jonathan Bowyer (HFMA, Executive Coach) and Claire Merrick (HFMA, Coaching & Mentoring Services Manager) to find out more. The Healthcare Financial Management Association (HFMA) is the professional body for finance staff in healthcare. For more than 60 years, it has provided independent and objective advice to its members and the wider healthcare community. It is a charitable organisation that promotes best practice and innovation in financial management and governance across the UK health economy through its local and national networks. The association also analyses and responds to national policy and aims to exert influence in shaping the wider healthcare agenda.